War, what is it good for? Absolutely nothin’. A ship emerges from a spacial rift, and everything changes. The Federation is at war with the Klingons, Tasha Yar is alive and back at tactical and Worf is the ship’s counselor (well, except not that last one). Turns out the ship that emerged is the Enterprise-C, the predecessor to Picard’s vessel, and its trip forward in time from the middle of a battle with the Romulans (in response to a distress call at a Klingon outpost more than 20 years earlier) changed history. Only Guinan, because of her Guinan-ness, knows something is up, so she tells Picard the Enterprise-C must return through the rift and face certain destruction to restore history and avert the war. The Federation is about to lose anyway (sad trombone), so Picard goes against the advice of his senior staff and convinces the Enterprise-C’s Captain Rachel Garrett (Tricia O’Neal) of Guinan’s thinking. After Garrett is killed in a minor skirmish with the Klingons, Yar (told by Guinan that she died a senseless death in the “right” history) transfers to the Enterprise-C. Then, Picard’s ship must cover the Enterprise-C from three Klingon vessels as it tries to go back through the rift. Just as the Enterprise-D appears to be lost, the Enterprise-C gets through and history is restored. Only Guinan has any knowledge of what’s happened, and Picard and Co., go back to business. From the standpoint of what we do on this site, this episode, on its own, wouldn’t have made the tapestry. That’s not to say it’s not one of TNG’s best. But, like “The City on the Edge of Forever” from TOS or DS9’s “The Visitor”, the events here didn’t really happen. The time reset undid what we saw during the episode. But … we learn later that sending Yar back with the Enterprise-C had huge effects in the Star Trek universe. Yar, captured by the Romulans with other Enterprise-C survivors, became the consort of a Romulan officer. That produced the child Sela (also played by Denise Crosby) who appears in the fourth and fifth seasons as a major Romulan player. She was part of the plot to brainwash Geordi and make him an unknowing assassin of a high-ranking Klingon (in “The Mind’s Eye”), she was instrumental in supporting one side in the upcoming Klingon civil war (in the “Redemption” two-parter) and she was part of the attempted Romulan conquest of Vulcan (in the “Unification” two-parter). In short, Sela kept herself busy. This episode probably has some time paradoxes we could explore. But big picture, we try not to get too deep into the logic of time travel on this site. Trek’s remarkably inconsistent with cause-and-effect stuff and pretty much says (in DS9 and Voyager) that there is no logic to time travel. In other words, after years of dealing with time-travel writing constraints, the creators pretty much threw up their hands. 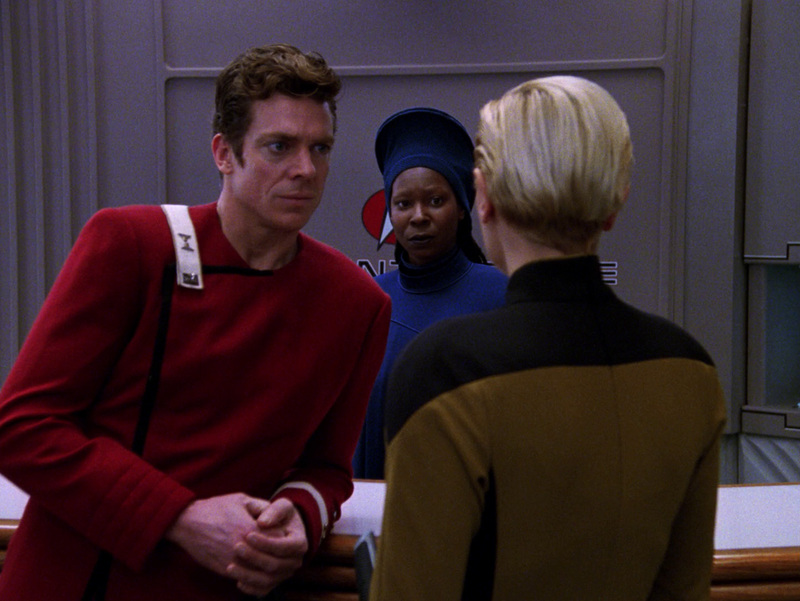 This episode, of course, hinges on Guinan’s ability to have a perception beyond linear time. This shows up in later episodes, but it’s a shame that Guinan’s back story was really never fleshed out. How do her people have this ability, or is she the only one who does? How is she so familiar with Q? Are her people more advanced than humans? But, really, that’s a small gripe. Keeping Guinan mysterious wasn’t the worst choice the creators could have made. There’s also the line from the Enterprise-C tactical officer Shooter McGavin — I mean, Richard Castillo (Christopher McDonald) that the Klingons and Federation were working on a peace treaty shortly before he left with the Enterprise-C. That’s part of the inconsistent storytelling regarding exactly when the two powers 1) stopped fighting and 2) became allies that we discussed in our review of “Star Trek VI: The Undiscovered Country”. In this episode and in much of TNG, it seems that the alliance is only about 20 years old — and “Star Trek VI” leaves the point unclear. But in DS9 and Voyager, the alliance is said to be about 80 years old, and that it was established immediately after “Star Trek VI”. That, of course, doesn’t jibe with Castillo’s comments — unless the two sides stopped being allies and became them again, or something. This episode is another instance where it’s clear the Romulans’ decades-long absence as discussed in “The Neutral Zone” was just bunk. Granted, in the alternate timeline, Picard and Co., don’t know what happened to the Enterprise-C. But it’s made clear later — and by implication here — that the “correct” history knows the Romulans attacked and destroyed the Enterprise-C about 20 years before the Romulans showed up in the first season of TNG, which was purportedly several decades since last they were seen. In fact, it’s implied that the loss of the Enterprise-C in the battle with the Romulans was of major historical import, as the gesture resonated with the Klingons and the two parties became allies. Most of the other complaints surround how the Enterprise-D still looks and feels relatively familiar, despite the fact that the Federation has been at war for 20 years. Much of the redress of the ship and the uniforms look great. But the large windows in the front of the ship (in Ten-Forward) and the fact that all the senior officers (sans Worf and Troi) are on the Enterprise-D is hard to swallow. But that’s just minor nitpicking. This episode is another example of third season TNG really hitting its stride. Some would say this is TNG’s finest showing. Personally, I prefer “The Best of Both Worlds” because of the dramatic payoff of seeing Picard assimilated by the Borg and Riker giving the “Mr. Worf … fire!” command. 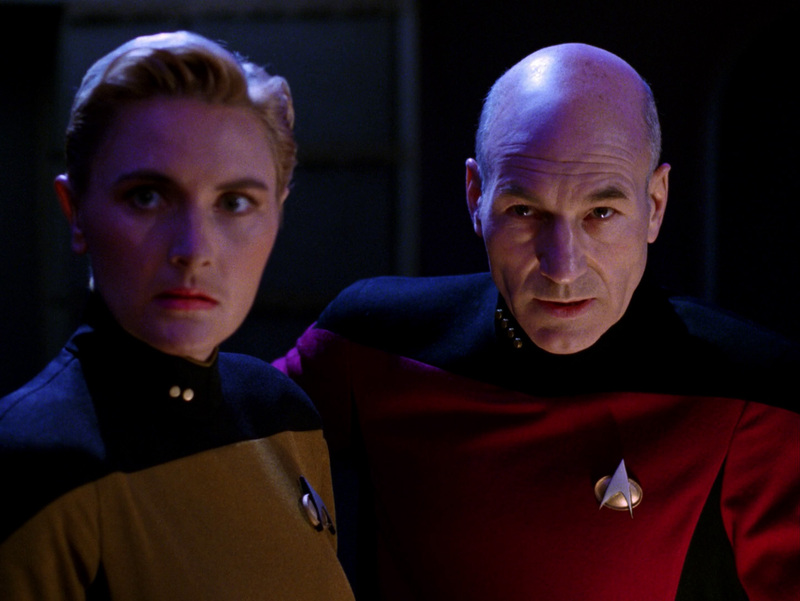 But “Yesterday’s Enterprise” is either second or third on my list of the best of TNG, right next to “The Inner Light”. It’s a small thing, too, but the introduction of the Ambassador-class starship (of which, the Enterprise-C is one) was kinda cool. Up until this point, TNG had mostly reused ships from the Trek movies (with the exception of Constellation-class vessels in “The Battle” and “Peak Performance”) and those ships all had a boxier feel than the Galaxy-class Enterprise-D.
Worf’s father conspired with the Romulans? Jigga-what?